Arnold of Chartres writes that "whoever had been on Mount Calvary, to witness the great sacrifice of the Immaculate Lamb, would there have beheld two great altars, the one in the Body of Jesus, the other in the heart of Mary; for on that Mount, when the Son sacrificed His Body by death, Mary sacrificed her soul by compassion." So much so, says Saint Antoninus, that whereas other Martyrs sacrifice their own lives, the Blessed Virgin consummated her Martyrdom by sacrificing the life of her Son, a life which she loved far more than her own, and which caused her to endure a torment which exceeded all other torments ever endured by any mortal on earth. As a general rule, the sufferings of children are also the sufferings of their mothers who are present at and witness their torments. This Saint Augustine declares, when speaking of the mother of the Machabees, who witnessed the execution of her children, Martyred by order of the cruel Antiochus: he says that "Love caused her to endure in her soul all the torments inflicted on each of her children." Erasmus adds that "Mothers suffer more at the sight of the sufferings of their children than if the torments were inflicted on themselves." This, however, is not always true; but in Mary it was verified; for she certainly suffered more in witnessing the sufferings of her Son than she would have done had she endured all the torments in her own person. "All the wounds," says Saint Bonaventure, "which were scattered over the Body of Jesus were united in the heart of Mary, to torment her in the Passion of her Son" so that, as Saint Lawrence Justinian writes, "The heart of Mary, by compassion for her Son, became a mirror of His torments, in which might be seen, faithfully reflected, the spittings, the blows, the wounds, and all that Jesus suffered." We can therefore say that Mary, on account of the love that she bore Him, was in heart, during the Passion of her Son, struck, scourged, crowned with thorns, and nailed to the very Cross of her Son. The same Saint Lawrence considers Jesus on His road to Calvary, with the Cross on His shoulders, turning to Mary and saying to her, "Alas, My Own dear Mother, where are you going? What a scene will you witness? You will be agonized by My sufferings, and I by yours." But the loving Mother would follow Him all the same, though she knew that, by being present at His death, she would have to endure a torment greater than any death. She saw that her Son carried the Cross to be crucified upon it; and, adds Abbot William, she also took up the cross of her sorrows, and followed her Son to be crucified with Him. Hence Saint Bonaventure considers Mary standing by the Cross of her dying Son, and asks her, saying, "O Lady, tell me where did you then stand---was it near the Cross? No, you were on the Cross itself, crucified with your Son." About these words of the Redeemer, foretold by the prophet Isaias, I have trodden the wine-press alone, and of the Gentiles there is not a man with me. (Isaias 63:3) Richard of St. Lawrence says, "It is true, O Lord, that in the work of human redemption You did suffer alone, and that there was not a man that sufficiently pitied You; but there was a woman with You, and she was Your Own Mother; she suffered in her heart all that You endured in Your Body." To show the sufferings endured by other Martyrs they are represented with the instruments of their torture; Saint Andrew with a cross, Saint Paul with a sword, Saint Lawrence with a gridiron; Mary is represented with her dead Son in her arms; for He alone was the instrument of her Martyrdom, and compassion for Him made her the Queen of Martyrs. On this subject of Mary's compassion in the death of Jesus Christ, Father Pinamonti gives expression to a beautiful and remarkable opinion: he says, that "the grief of Mary in the passion of her Son was so great, that she alone compassionated in a degree by any means adequate to its merits the death of a God made man for the love of man." Blessed Amadeus also writes, that "Mary suffered much more in the Passion of her Son than she would have done if she herself had endured it; for she loved her Jesus much more than she loved herself," Hence Saint Ildephonsus did not hesitate to assert, that "the sufferings of Mary exceed those of all Martyrs united together." Saint Anselm, addressing the Blessed Virgin, says, "The most cruel torments inflicted on the holy Martyrs were trifling or as nothing in comparison with your Martyrdom, O Mary." The same Saint adds, "Indeed, O Lady, in each moment of your life your sufferings were such that you could not have endured them, and would have expired under them, had not your Son, the source of your life, preserved you." Saint Bernadine of Sienna even says, that "the sufferings of Mary were such that had they been divided among all creatures capable of suffering, they would have caused their immediate death." Who, then, can ever doubt that the Martyrdom of Mary was without its equal, and that it exceeded the sufferings of all the Martyrs; since, as Saint Antoninus says, "they suffered in the sacrifice of their own lives; but the Blessed Virgin suffered by offering the life of her Son to God, a life which she loved far more than her own." The Martyrs suffered under the torments inflicted on them by tyrants; but Our Lord, Who never abandons His servants, always comforted them in the midst of their sufferings. The love of God, which burnt in their hearts, rendered all these sufferings sweet and pleasing to them. Saint Vincent suffered, when on the rack he was torn with pincers and burnt with hot iron plates; but Saint Augustine says that "the Saint spoke with such contempt of his torments, that it seemed as if it was one who spoke and another who suffered." Saint Boniface suffered when the flesh was torn from his body with iron hooks, sharp reeds were forced under his nails and melted lead was poured into his mouth; but in the midst of all, he could never cease to thank Jesus Christ, Who allowed him to suffer for His love. Saint Lawrence suffered when roasting on a gridiron; "but the love which inflamed him," says Saint Augustine, "did not allow him to feel the fire, or even that prolonged death itself." The greater the love of the Martyrs for Jesus Christ, the less they felt their pains: and in the midst of them all, the remembrance of the Passion of Christ sufficed to console them. With Mary it was precisely the reverse; for the torments of Jesus were her Martyrdom, and love for Jesus was her only executioner. Here we must repeat the words of Jeremias: As the sea is all bitterness, and has not within its bosom a single drop of water which is sweet, so also was the heart of Mary all bitterness, and without the least consolation: Who shall heal you? 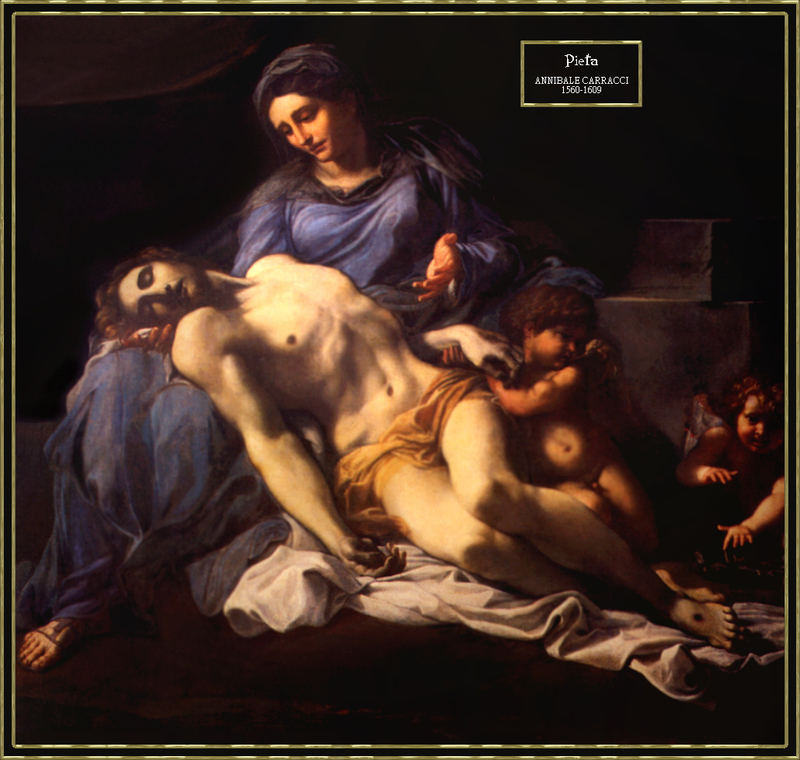 Her Son alone could heal her and heal her wounds; but how could Mary receive comfort in her grief from her crucified Son, since the love she bore Him was the whole cause of her Martyrdom? "To understand, then, how great was the grief of Mary, we must understand," says Cornelius a Lapide, "how great was the love she bore her Son." But who can ever measure this love? Blessed Amadeus says, that "natural love towards Him as her Son, and supernatural love towards Him as her God, were united in the heart of Mary." These two loves were blended into one, and this so great a love that William of Paris does not hesitate to assert, that Mary loved Jesus ''as much as it was possible for a pure creature to love Him." So that, as Richard of St. Victor says, ''as no other creature loved God as Mary loved Him, so there was never any sorrow like Mary's sorrow." Now there stood by the Cross of Jesus His Mother. Let us stay awhile to consider these words before concluding our discourse; but I entreat you to renew your attention. There stood. When Jesus was on the Cross, the disciples had already abandoned Him; they had done so from the moment in which He was taken in the Garden of Olives: then the disciples all leaving Him fled. (Matt. 26:56) The disciples abandoned Him; but His loving Mother did not abandon Him; she remained with Him until He expired. There stood by. Mothers fly when they see their children suffer much, and are unable to give them relief; they have not the strength to endure the torment, and therefore fly to a distance. Mary beheld her Son in agony on the Cross; she saw that His sufferings were slowly depriving Him of life; she desired to relieve Him in that last extremity, but could not; but with all this she did not fly, she did not go to a distance, but drew nearer to the Cross on which her Son was dying. She stood by the Cross. The Cross was the hard bed on which Jesus Christ had to die. Mary, who stood by its side, never turned her eyes from Him; she beheld Him all torn by the scourges, thorns, and nails; she saw that her poor Son, suspended by those three iron hooks, found no repose. She, as I have already said, would have desired to give Him some relief; she would have desired, at least, that He should have expired in her arms; but no, even this is forbidden her. "Ah, Cross!" she must have said, "restore me my Son; you are a gibbet for malefactors, but my Son is innocent." But wait, O sorrowful Mother; God's will is that the Cross should only restore you your Son when He has expired. Saint Bonaventure, considering the sorrow of Mary in the death of her Son, writes, that "no grief was more bitter than hers, because no son was as dear as her Son." Since, then, there never was a son more worthy than Jesus, nor any mother who ever loved as Mary loved, what sorrow can be compared with the sorrow of Mary? "Ah, there never has been in the world a more amiable Son than Jesus," says Richard of St. Lawrence, "nor was there ever so loving a Mother. Had there been less love between this Mother and Son, His death would have been less cruel, their griefs would have been diminished: but the more tender were their loves, the deeper were their wounds." Mary saw that death approached her Son; therefore, casting her compassionate eyes upon Him, she seemed to say, "Ah, Son, You already depart, already You leave me; and are You silent? Give me a last remembrance." Yes, He did so. Jesus Christ left her a remembrance; it was this: Woman, He said, behold your son, referring to Saint John, who stood near; and with these words He bade her farewell. He called her woman, that by the sweet name of mother He might not increase her grief: Woman, behold your son, he will take charge of you when I am dead. There stood by the Cross of Jesus His Mother. Let us, finally observe Mary, who stood at the foot of the Cross and beheld her Son expire. But, a God, what Son was it that died? It was a Son Who from all eternity had chosen her for His Mother, and had preferred her in His love to all men and Angels: it was a Son so beautiful, so holy, so amiable; a Son Who had always obeyed her; a Son Who was her only love, for He was her Son and her God; and Mary had to see Him die before her eyes, of pure suffering. But behold, the hour of the death of Jesus has already come; the afflicted Mother saw her Son then enduring the last assaults of death; behold, again, His Body was already sinking, His head drooped down on His breast, His mouth opened, and He expired. The people cry out, "He is dead! He is dead!" And Mary also said, "Ah, my Jesus, my Son, You are now dead!" When Jesus was dead, He was taken down from the Cross. Mary received Him with outstretched arms; she then pressed Him to her heart, and examined that head wounded by the thorns, those hands pierced with nails, and that body all lacerated and torn. "Ah, Son," she said, "to what has Your love for men reduced You!" But the disciples, fearing that with her Son clasped in her arms she would die of grief, out of compassion approached her, and with reverential determination, removed her Son from her arms, wrapped Him in the winding sheet, and carried Him away to bury Him. The other holy women accompanied Him, and with them the sorrowful Mother followed her Son to the tomb; where, having herself deposited Him with her own hands, she bade Him a last farewell and retired. Saint Bernard says, that ''as Mary passed along the way, her sorrow and grief were such, that all who met her were thereby moved to tears;" and he adds that "those who accompanied her were weeping rather for her than for Our Lord." My readers, let us be devout to the sorrows of Mary. Saint Albert the Great writes, that ''as we are under great obligations to Jesus Christ for His death, so also are we under great obligations to Mary for the grief which she endured when she offered her Son to God by death for our salvation." This the Angel revealed to Saint Bridget: he said that the Blessed Virgin, to see us saved, herself offered the life of her Son to the Eternal Father: a sacrifice which, as we have already said, cost her greater suffering than all the torments of the Martyrs, or even death itself. But the Divine Mother complained to Saint Bridget that very few pitied her in her sorrows, and that the greater part of the world lived in entire forgetfulness of them. Therefore she exhorted the Saint, saying: "Though many forget me, don't you, my daughter, forget me." For this purpose the Blessed Virgin herself appeared in the year 1239 to the founder of the Order of the Servites, or Servants of Mary, to requested them to institute a religious order in remembrance of her sorrows; and this they did. Jesus Himself one day spoke to Blessed Veronica of Binasco, saying, "Daughter, tears shed over My Passion are dear to Me: but as I love My Mother Mary with an immense love, the meditation of the sorrows which she endured at My death is also very dear to Me." It is also well to know, as Pelbart relates it, that it was revealed to Saint Elizabeth of Hungary, that Our Lord had promised four special graces to those who are devout to the sorrows of Mary: 1st, that those who before death invoke the Divine Mother, in the name of her sorrows, should obtain true repentance of all their sins: 2nd, that He would protect all who have this devotion in their tribulations, and that He would protect them especially at the hour of death: 3rd, that He would impress upon their minds the remembrance of His Passion, and that they should have their reward for it in Heaven: 4th, that He would commit such devout clients to the hands of Mary, with the power to dispose of them in whatever manner she might please, and to obtain for them all the graces she might desire. There are two kinds of Martyrs, one in open suffering, the other in the hidden virtue of the spirit. For many, enduring the snares of the enemy and resisting all carnal desires, because they have sacrificed themselves in their hearts to Almighty God, have also become martyrs in time of peace, and if they had lived in time of persecution, they could have been Martyrs in reality.